I love those aromatic rice sidedishes that you get at indian places. They have so much more body and flavour than your plain old rice. Having one on these on the side of your carefully prepared curry or korma just makes the whole dish work! Aside from an awesome naan ofcourse. They are so easy to make, especially if you have a steamer or rice cooker. Why not? Heat a saucepan, spray and toast the whole herbs. Add to the rice and water. Steam using the directions on your steamer or rice cooker. If you do not have a steamer or rice cooker refer to my sushi or onigiri recipe for stovetop directions. When I do rice on the stove thats how I do it! This makes enough rice to serve four. Each serving contains 139 calories, 0.8 grams of fat and 1.7 grams of fiber. 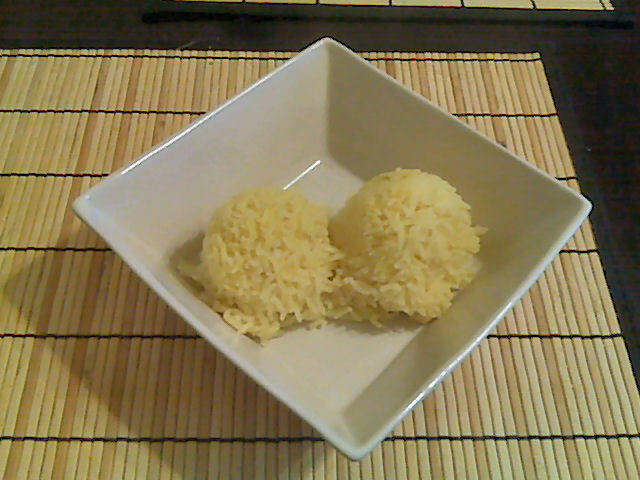 My recent go at this recipe I used organic basmati rice and it was awesome! If you can get your hands on some for a decent price give it a try. I think it may have picked up the herb flavours more than the regular rice. This entry was posted in Dinner, Sidedish and tagged rice. Bookmark the permalink.